Let’s go ahead and say the newly expanded Quebec Nordiques and the Las Vegas Team Yo Be Named Later were granted franchises by the NHL. In that case, the 2017 NHL Rookie Draft will be the overall foundation for both teams. The expansion teams will draft number one and two overall in each round (we better win that coin flip), giving them a leg up on other struggling teams that would normally hold those picks. Since we have two seasons to kill before the draft I’m going to keep an eye on the projected class of 2017. Nowadays with juniors, college and select teams, it’s easier to spot NHL quality talent even younger than before. The competition and quality of Canadian Juniors is arguably better than most minor leagues in the world. Hockey East, Big Ten, ECAC and WHCA all produce high level U.S. talent too. As well as high school select teams that are basically all stars from collective towns and cities. In New England, there are schools nicknamed “hockey factories” that fine tune young players to be college ready and beyond. Schools like Thayer Academy have notable alums like; Jeremy Roenick, Tony Amonte, Brooks Orpik, Ryan Whitney and 2000 Hobey Baker winner Mike Mottau. Check out Avon Old Farms in Connecticut, NHL alums include; Jonathan Quick, Brian Leetch, Cam Atkinson, Nick Bonino and Chris Higgins. Crazy loaded. So all that being said, let’s lookout at one of the top prospects ranked for the 2017 draft. That’s right the Wheat Kings of the Western Hockey League baby. The almost 17-years-old (9/19/98) Patrick, will be draft eligible in 2017 and is widely considered the front runner as the top pick. Top line Centers are tough to come by, especially at 6’3 and growing (watch him light a kid up in December of 2014. He’s #19 in white and yellow). Nolan had a monster rookie season with the Wheat Kings totaling 30 goals, 56 points in 55 games. More importantly he scored 15 goals in the playoffs. That’s why he is a top prospect. After being placed on Team Canada for the 2015 Memorial Cup, reviews were strong about the young Center. Patrick scored 3 goals in four games for the Canadian Juniors, and won the gold medal. 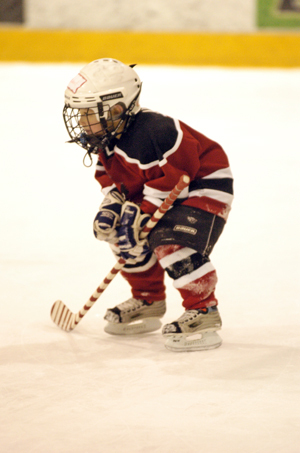 Scouts after the tournament said Patrick’s maturity was showing much faster than some thought. Las Vegas and Quebec will be heavily scouting Nolan Patrick over his next two seasons of Juniors, as well as many other players. It’ll be interesting to see how Nolan follows up his stellar rookie season. One point a game is going to be tough to beat. Do yourself a favor and catch a Wheat Kings game sometime. Great jerseys, great talent, and you might be watching the next Strip headliner. 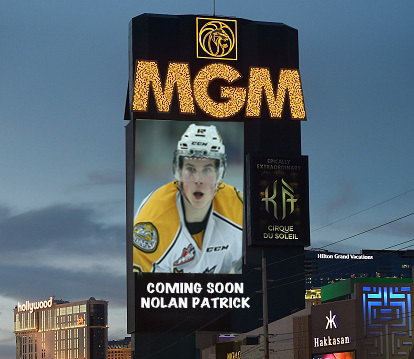 Could Nolan Patrick be Las Vegas’ 2017 #01 Pick?